Web analytics is the collection, measurement, reporting and analysis of web data so that there is a greater understanding of the web usage when optimizing the site. Web analytics is not only a measurement tool for web traffic, but also can be used as a business tool for marketing research. It allows for assessment and improvement of the web site effectiveness. You can estimate how web traffic changes after the launch of a new advertising campaign. Web analytics provide information such as hits to the site, number of visitors and the number of page views as well as other details related to your web site. On-site measures the visitor's behavior once on your website. For example, how different landing pages are associated with the on-line purchase. It also measures the performance of your website in a commercial context. 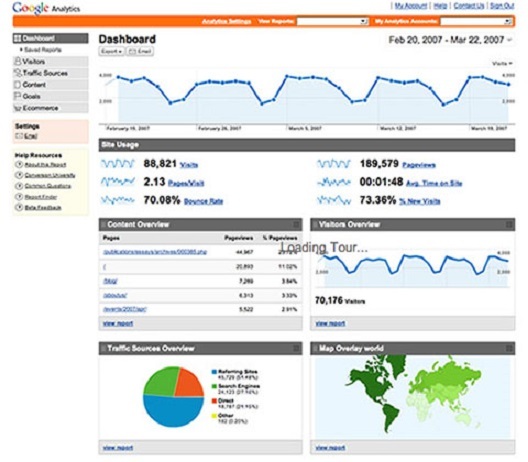 On-site web analytics is used to improve the website's marketing campaign and the audience's response. Off-site refers to website measurement & analysis whether you own the site or just maintain the site. It includes the measurement of the potential audience, visibility and comments. In the past, on-site analytics were only used for visitor measurement. But, recently that has changed because vendors are producing tools that cover both on-site as well as off-site web analytics. Google analytics is the most widely used web analytical service and best free tool available to help you understand your website traffic. There are other options available through Google for web analytics such as Google Webmaster Tools & Google Web Optimizer . If you want to learn more about web analytics and other information, we suggest going to Google and see their available tools. Fill out the form below and we will give you a call to discuss your present situation and decide the best approach for you right now to help your improve your internet presense.